Hire Children’s party bouncy castes and make your kid’s parties the best possible! Yorkshire doesn’t simply provide top of the range bouncy castles for children’s parties, we will recommend an inflatable that would be perfect for you in terms of finance, your garden’s landscape, how many people are attending the event, and of course a visually attractive bouncy castle that everyone will love and want to jump on. So if you’re having a Children’s party for your child or organising one for a school event call us now on 0845 519 3507 or 07946438578. We cover the whole Yorkshire area which includes York and Leeds. 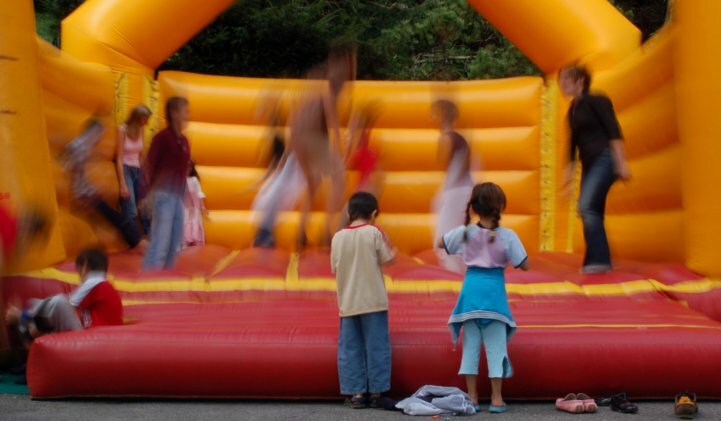 We’d be more than happy to provide a free quote on Bouncy Castle Hire via phone or email. DJ Ollie Bouncy Castles offer complete customer satisfaction for your kids party entertainment or other event. We deliver, set up and inflate the Bouncy Castles without fuss and can fit them in your Garden, Car Park or location of choice depending on suitability. Our service can also include supervision if needed and we can also include full health and safety instructions to make sure your party is completely safe for the children or guests. Once finished we deflate and collect the Bouncy Castle leaving you with a clean and tidy area again.